Ohio Biographies, Images, Pictures and Biography Information on famous Artists, Authors, Presidents, Actorsand more in Ohio. Sherman was one of the great Union generals of the Civil War. In 1847, as a lieutenant, he arrived in Northern California. He was there to help gather information on the gold fields for President Polk. 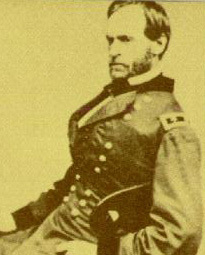 Sherman resigned from the Army in 1853 with plans of settling in California. In San Francisco, he managed the construction of a bank for Lucas, Turner, and Company. For a time, he served as a commander in the California militia. Taking up the Union cause during the Civil War, Sherman commanded at a number of major battles, including Bull Run (leading a brigade), Shiloh (leading a division), Vicksburg (leading four divisions), and the Atlanta Campaign (leading 100,000 men). After the war, Sherman was appointed to the Indian Peace Commission. In 1869, President U.S. Grant appointed Sherman General of the Army.